Irish Blog: OLYMPICS LONDON SAY NO ! 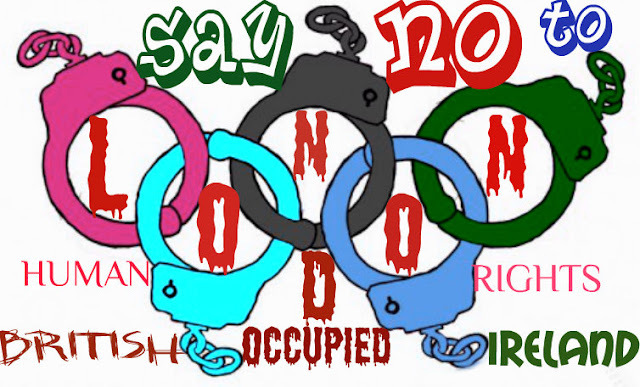 OLYMPICS LONDON SAY NO ! Human rights concerns In British Occupied Ireland. Internment without trial of political prisoners. Solitary confinement and torture of Marian Price a prisoner of conscience kidnapped by autocrat Ghengis Pater Son. Ongoing British emergency laws with harassment and intimidation of civilians. Ongoing collusion between British occupation forces, intelligence and loyalist sectarian paramilitaries; with unjust killings and murders along with excessive punishments and degrading strip-searching in prisons. British government still behaving unlawfully and immorally, with respect to the murders of innocent people with ongoing ill-treatment in their interrogation centres and their corruption of the legal process. Human Rights Watch's children's rights division a general expert in children, has conducted human rights investigations and written reports on abuses of children in Occupied Ireland by the British.